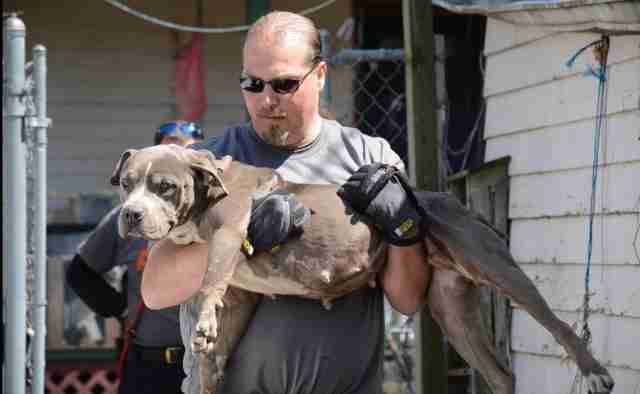 Dozens of dogs have just been seized from suspected dogfighting in the Midwest. 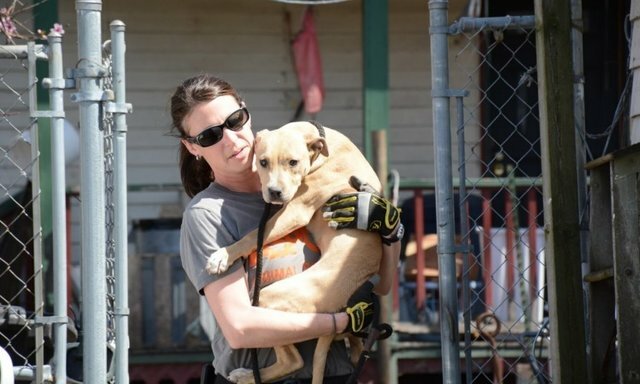 Obviously frightened, disoriented and emotionally and physically exhausted, the 64 pit bulls were carried by their rescuers out of their horrific situations and brought to safety. 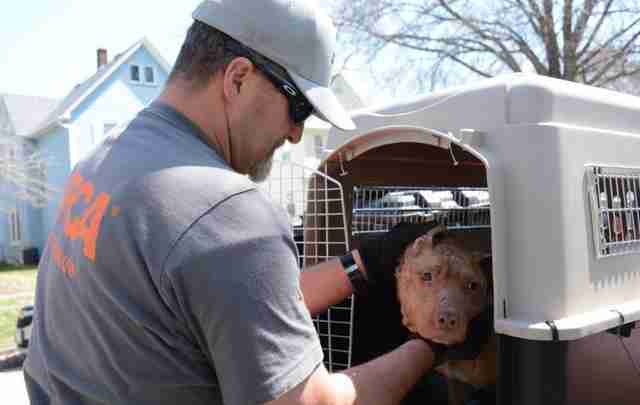 Responders from the ASPCA are currently still working with the FBI Quad Cities Federal Gang Task Force and the Rock Island Police Department in Illinois to help rescue the dogs involved, according to the ASPCA. Following an investigation that began almost a year ago, 10 search warrants were served by the FBI on Thursday. The dogs were found on various properties in Rock Island, Illinois, and Davenport, Iowa, "tethered on heavy chains and [near] training devices consistent with dogfighting, along with narcotics and a firearm," according to a press release sent to The Dodo. 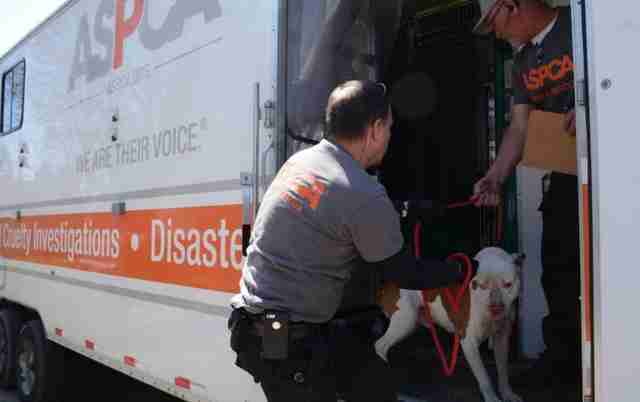 ASPCA veterinarians, behaviorists and responders will work with the dogs at an undisclosed location, providing much-needed attention and medical care. As the ASPCA works with law enforcement and prosecutors, the dogs' best interests and safety will be taken into account until the court determines custody. "The level of brutality we continue to see in organized dogfighting rings is profoundly troubling," Tim Rickey, vice president of the ASPCA's Field Investigations and Response team, said in the release. "We're relieved these animals have finally been removed from this cycle of violence. Many people will be surprised to learn that dogfighting is happening in their community. It's an underground activity that goes mostly unnoticed by the public, but it happens all across the country." 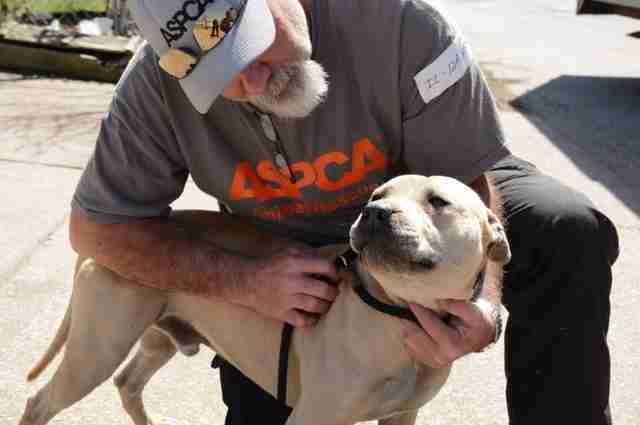 As it celebrates its 150th anniversary, the ASPCA continues working to help end dogfighting. Recent efforts included collecting almost 50,000 comments early this year from the public to help urge the U.S. Sentencing Commission to increase sentencing from three to five years for federally convicted dog fighters. On Friday, the commission voted to increase the recommended jail sentence for animal fighting to 21 to 27 months. Previous guidelines only recommended up to a year in prison. "These new guidelines will go a long way to protect hundreds of thousands of dogs in the United States who are forced to fight and suffer each year purely for the entertainment and financial gain of their owners," Rickey said in a statement. You can learn more about the ASPCA's crackdown on dogfighting and how you can help here.